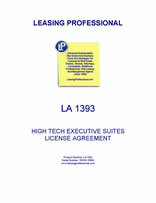 This form is a contractual revocable license agreement (in lieu of a lease) for a tenant (referred to in the License as the Client) taking space in an executive suites complex. In addition to the office(s) provided, the landlord (referred to in the License as the Owner) also provides high tech communications services to the Client. The characterization of the transaction as a license by the Owner (as opposed to a lease) is presumably to avoid having to use traditional remedies (i.e., unlawful detainer, etc.) in the event of tenant default. Here, the Owner apparently hopes to use the contractual remedies contained in the license in lieu of traditional real estate lease remedies. This sort of arrangement can be ideal for tech companies such as hosting companies and software development companies, which do not occupy a great deal of space for their operations. Alternately, this approach is suitable for a satellite operation not physically located with the main location of the business. 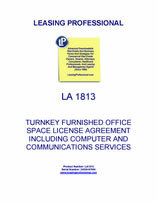 This form is license agreement (as opposed to a lease agreement) for office space with a variety of computer and communications services also provided by the "landlord." The term is for one year and is renewable. The rent and charges for various services is specified in an exhibit to the agreement on an a la carte basis. The agreement provides for the furnishing to the "tenant" of various computer workstations, fax lines, telephone and communications services with unlimited long distance in the United States, internet and server hosting arrangements and security badges and security cards to the employees of the tenant.